If you plan on reading this novel prepare to plow through the first 90% without much enthusiasm. But beware, this novel is like a deadly spider that is slowly lowering itself down from the ceiling toward the back of your neck. By the time you notice it, it's too late, and the scariest part, (other than the fact that it's just bitten you), is that it has been hanging there ALL ALONG, and you had no idea. A stranger on the Internet instructed me to review this book, so I guess I’ll do as I’m told.This book is okay. Actually, the second half of this book is great, but still not great enough to resurrect the full work to anywhere beyond its three-star label of mediocrity.Often with mystery novels there is a slow but steady build of intensity, a momentum that gathers in a such a way that the reader remains riveted to the end. That occurs here, as well, so I don’t ascribe my disappointment with the first half of the book to any lack of momentum on its part. Instead, I think I was turned off by the writing. In fact, I’d say that the plot drive in the second half was so well executed that it overcame what I would otherwise have to describe as naïve, whimsical writing. But in the author’s defense, he was (at the time of this book’s initial publication, anyway) a naïve writer. The Other was Thomas Tryon’s first novel, written after having spent much of his early adulthood as a Hollywood film actor.The Other is a frame story, but the identity of the narrator is unknown until the book’s denouement. The story involves two twin boys, one of whom is a vicious evildoer while the other acts as his doe-eyed apostle. Of course, every evil deed performed is accompanied by telling amounts of circumstantial ambiguity so one could probably see “The Big Reveal” coming a mile away, especially if he’s seen enough M. Night Shyamalan films. Still, the reveal (and the events which occur after it) are well executed, as I stated earlier, which makes this book—all being said—ok. Deliciously horrifying and thoroughly entertaining short read. Tryon was good at painting scenes with vivid descriptions and setting atmospheres with his words. The story took place in summer at a small town, and I could almost feel the humid, pressing heat, the distant screams of children, the grass tickling my thighs. He has a way of characterising the people in the story too - Niles and Holland, their unwelcome cousin and his family, their mother wilting away in her room in grief, their feisty Russian grandmother. I love the sense of foreboding in the background that pervades the main story, it creeps up on you and slams home rather quickly at the end with one reveal after another. I really enjoyed this. I'll likely expand this review someday, but for now I'll just say that this is one of those books that truly deserves the status of "horror classic." Tryon's prose has a way of keeping the reader at arm's length. I don't mean that in a bad way at all because Tryon is a fantastic writer. I mean that he keeps us just far enough outside the mysteries of his story for their reveals to be as stunning as any in horror fiction. As far as great twists go, I'd say The Other is one of the twistiest, most surprising novels I've ever read. At least twice and perhaps as many as three times I audibly gasped during this book and sat there thunderstruck at what I'd just read. In that respect, I'd compare this one to Ira Levin's A Kiss before Dying, which also contains some powerhouse shocks. So read The Other. It's one of the top twenty or thirty horror novels I've ever read. Both this one and (to a slightly lesser degree) Harvest Home are must-haves for any horror fan's library. Oh my, now that was just full of creepy greatness! Although I knew the premise of the book and sensed that something just didn't feel right from the beginning, I did not see the big reveal coming. Of course, I look back now and can see all the clues nicely sprinkled throughout and wonder why I didn't put two-and-two together sooner. And then with ~30% of the book remaining after the big reveal, I wondered at how much was there left to keep me interested in the book. Oh, there was plenty remaining to give me the heebie jeebies! The shivers just kept coming and coming right to the very end. And I'm still thinking about certain scenes...Also, the audio narration by William Dufris was fantastic. It's hard to believe that this is Thomas Tryon's first novel, The Other is fully formed and sophisticated in its characterization of a small town, Pequot's Landing, in Connecticut in the 1930s and the central family as well. Many of the characters are surely drawn from life and Tryon gets all of the details right in a fashion that likely still makes Stephen King envious. King definitely was influenced by this book--maybe he should reread Tryon and get back on track. The Dome missed huge opportunities of subtle small-town life that is rife in Tryon's The Other and Harvest Home. I appreciated all of the period details that were effortlessly scattered throughout, the Chautauqua desk in particular was fun to look up. The novel was apparently a raging best-seller back in 1972 and it is easy to see why. It is one of the best horror novels I've ever read, full of terrible acts and secrets without ever scraping the bottom of the barrel in taste or quality. With Niles and Holland Perry, the themes of growing up and the nostalgia, I was reminded of a more cynical Dandelion Wine and Something Wicked This Way Comes. Tom Tryon was a relatively successful actor of his day, but was growing tired of Hollywood and the game that had to be played as one got older there. I've found no evidence so far, but Tryon must have been writing for years before this novel because of the confidence of it. I'm changing my mind last minute and giving this the full five stars, because even though when I was much, much younger, my Dad rented the faithful movie adaptation (Tryon wrote the screenplay); even having seen that I was still shocked and riveted by what happened in this book. Simply, no movie could convey the subtlety of what happens in The Other. Considering new shelf name for books like this: "Migraine-Inducing Literature"
I first made my acquaintance with THE OTHER 42 years ago, and have just finished my 3rd or 4th re-read. If you're looking for King/Koontz-style horror, you'd best look elsewhere, as THE OTHER harks back instead to Ray Bradbury, Shirley Jackson and even Henry James. Although there is "horror" here, it is merely one element in an exquisite, evocative tale. To read this book is to be transported to a small Connecticut town in the '30s. You can practically FEEL the thick summer heat, the musty air of a storage room, the sleazy atmosphere of a traveling carnival. You can almost HEAR the programs on the radio, the far-off notes played on a harmonica, the strangled gasps of fear. And you can very nearly SMELL the cool dankness of the apple cellar, the grassiness of new-mown hay, the frothy scent of fresh-spilled blood. Calling THE OTHER a classic horror novel is far too limiting. It is nothing less than a classic of American Literature, and one of my Favorite Books of All Time. Thomas Tryon is an author to reckon with! A must read for anyone who loves horror. I Cannot recommend this enough. This story was so finely crafted, it had me questioning every written page. Its a tale of twin boys who hold gruesome secrets and a very loving and likeable aunt who has a secret herself. Its mostly sad, but beautifully written. I love this story and look forward to reading more of his work. Holy Sh*t! I didn't know anything about this book when I picked it up from a secondhand bookstore. This is easily one of the best books I have ever read. It is so shocking and insanely scary. I recommend going into this not know anything about the story and I'm sure it will leave you as shocked as I was. HIGHLY recommended! Wow! Fascinating read and oh so scary. "”Things cannot ever be the same again. Not for any of us. Not any more. We sometimes reach a point in our lives where we can’t ever go back again, we have to go on from there. All that was before is past now. It went too far. Everything has gone too far. It must stop, do you see? Now--it must--stop.No more game?No. No more game.” Yes, the game went way to far, Ada. And you're to blame for all that happened in the small Connecticut town, Pequod Landing, that summer. Two Identical twins, but oh so different."”Twins? With different birthdays? How unusual. Indeed for identical twins, very. Oh yes, there were the mixed signs, on the cusp, as one says--they should have been more alike; nevertheless, the difference. Holland a Pisces, fish-slippery, now one thing, now another. Niles an Aries, a ram blithely butting at obstacles. Growing side by side, but somehow not together. Strange. Time and again Holland would retreat, Niles pursue, Holland withdraw again, reticent, taciturn, a snail in its shell.”I can't get into the plot more without revealing major spoilers, so I won't. I remember Thomas Tryon from his role in The Cardinal, but I had no idea that he wrote nor how well. This novel is almost lyrical. It's a horror story, but it also has what we would consider some old Gothic charm in it. It also has some characteristics that I adore in Southern Literature, though the novel is set in New England. The 1972 movie screenplay was also written by Tryon and is faithful to the novel. I'd recommend anyone to watch it. (I did after reading the novel.) Horror is something I normally don't gravitate toward (I have to be in the mood), and I really didn't expect a horror novel to end up on my all time Favorites Shelf! "Saxophones are the devil's instrument. "Hell yeah. I love Ada. In a weird way, I blame Dead Poet's Society (one of my favorite films from way back) for my hate of saxophones, but it's hard to explain and has no place in this review.Anyway.I scroll down at all these reviews that are made without spoilers and all I can think is how?I can say this: The writing is gorgeous and mesmerizing. The characterization, haunting. The twists...well...I read it as a writer without meaning to, because of the gorgeous writing, which means I foresaw much.It was wrought with rich, rich symbolism. Gorgeous, unobtrusive-to-those-who-don't-get-it symbolism. And metaphor. I could eat all that up with a spoon.And with that, the review turns to complete spoiler. (view spoiler)[Dude, I knew almost before I opened the book that one twin was dead. I knew by the end of the first first-person section which one.Here's the important part; it in no way detracted from my enjoyment of the novel. In fact, it enhanced it, because I got to marvel at Tyron's foreshadowing, his clues, his art, his craft, his freaking construction. I am in awe.And here's the real kicker, to me: in spite of knowing that, I still loved Niles. Loved him, and sympathized, and wished for Ada (since she seemed to know, at least somewhat) to freaking help him.And still understood her heartache at what she believed she had to do. It was...Oh, lord, my emotions.I loved the Game. Yeah, it was creepy and it opened up the basis for everything, but I loved it, and I knew it was the basis for everything as soon as it was introduced. I thought it was great. Partly because of what it is, partly because when I read it and realized it was What Made the Twist, I just thought it was perfect. (hide spoiler)]Literary horror. Totally. I just finished this novel, and wow, I'm still trying to process how surprised I am that this gem of a horror story isn't more popular. Published in 1971, it was a huge best seller at the time. In the afterword of the edition I read, Dan Chaon discusses how this book, along with others like Rosemary's Baby and The Exorcist, were some of the first to start the immense popularity of horror novels in the 1970's. Since I'm such a huge fan of the genre, I'm shocked that I didn't even know it existed until a few months ago when I saw it in a "scariest books" list online.This book has a fabulous twist. I knew something was going to happen or be revealed, but I had no idea what was coming. The prose is also beautiful and atmospheric, which isn't especially typical in the horror genre. The novel is really a number of things all at once. It's a creepy murder mystery, a reflection on bygone days, a coming of age story, and a study of a family undergoing intense grief and hardship. It's also a very deep reflection on relationships, and how sometimes the love you feel for another can do more harm than good.I can't recommend this book enough, especially as a summer read, since it takes place in the hottest months, during a time before air conditioning, when young boys would play in the haylofts of barns, and adults would sit on their porches, fanning themselves and drinking cold sarsaparilla and root beer to beat the heat.Thankfully, The Other is still in print, and I didn't have to try to find an old copy online. This is a must-read for all horror lovers. It's really just a great book, period. What can I say that others haven't already? What a good book.I read it in one sitting and I think that that is the way to read it. I was genuinely surprised by the plot twists 3/4 of the way through and I have read A LOT of horror so that says something right there.Excellent prose which slowly build a sense of unease throughout the book.You know from the beginning that something is wrong but just can't put your finger on it until the revelation.I did not find the writing dated at all.It seems that there are some universal truths that stay in the front of your mind throughout the book.Very creepy.I will recommend this book to a great majority of my friends who like a scary tale. This took me far too long to get through, I swear I'm a much faster reader than this.. Even though the "secret" is fairly easy to figure out, I found that once the true identity of 'the Other' is confirmed for the reader is when the story actually picks up and becomes more intense. That's how it played out for me, at least. On a side note, this is the second book written by an actor that I've read recently.. praise for people being multifaceted.. or overzealous about their many talents.. I loved the book! This is an amazingly sick book! At the beginning, it seems nothing is happening but you have to read carefully because there are clues from the very first page. I saw the 1972 movie first and knew the "twist" / secret all along. By mid of the book, I had already discovered all the "clues", so if you pay attention, it is somehow clear what was going on.In any case, I doubt that anybody can see ALL the little details. Even though I saw the movie, I was surprised by the ending of the book. Personally, I don't get it. This was supposed to be a great book, one of the classics of horror literature. I'll vote it to be one of the boring books of horror literature. I couldn't finish it. I got halfway and had to dump it. Long prose, no atmosphere, little suspense. Read it if you like but I wouldn't recommend it. An incredible psychlogical thriller with brilliant twists and turns. Superb character development, and some scary supernatural qualities make THE OTHER a true classic. Haunting, and highly recommended. I have tried to finish "The Other" by Thomas Tryon on two separate occasions. The first was in December of 2011, when I thought I just wasn't in the frame of mind to focus on it, and the next was just now. This will be my last attempt, as I'm fully convinced the book just isn't for me.I had been looking for this book for a long time after finding it on many "Best of Modern Horror" lists and was fortunate enough to find an old paperback copy in a used bookstore. Had I known then what I know now, I wouldn't have searched for it so laboriously.The novel, which was written in the early '70s and concerns a pair of twins born on different days with different astrological signs, is built entirely around a mid-point plot twist. And since this twist has been done to death in the past forty-plus years, none of what happens is all that hard to see coming. Worse than that, the novel is insufferably slow. The writing is excessively wordy with trivial passages and countless meandering run-on sentences. Basically, the reader is forced to sift through pages and pages of obsessive, flowery description to get to a plot development they already see coming.It's a shame, as I was really hoping to discover a new favorite here. The Other was 20th century mass-market horror at its best; it was suspenseful, eerie, disturbing and incredibly well-written. I’d never heard of Thomas Tryon’s 1971 novel “The Other” until I saw an ad for a reissue by the New York Review of Books Press. NYRB reliably performs the same service to literary classics that the Criterion Collection offers to cinema on DVD, curating a long list of deserving titles; my trust in this impressive work of high-literary psychological horror was implicit, and it was well rewarded.“The Other” was, remarkably, a best-seller followed by a film version with a screenplay by Tryon. Yet it’s hard to imagine it existing outside of the more abstract possibilities of prose, where it combines an ethereal lyricism with a dispassionately dark, almost amoral vision; imagine Malcolm Lowry meets Shirley Jackson meets Patricia Highsmith, if you can. In 1935, twin brothers Niles and Holland Perry spend summer with their family, a model of eccentric dysfunction. Their father has recently died in an accident, leaving their mother in a state of hermetic detachment and depression. The parental role is filled by their Russian grandmother Ada, who offers the benign, introspective Niles escape through a powerful game of creative empathy: She teaches him to imagine a point of view, such as that of a dragonfly, and envision its actions, its perceptions and emotions, effectively becoming the other through an act of concentrated identification. Holland is less interested in pensive flights of fancy. As Niles’ opposite, he is detached and superior, cynical, mocking, and prone to cruel practical jokes. His presence is peripheral and malevolent, but Niles feels a strong attachment to his darker sibling.These characters pass through a languid summer, evoked by Tryon as a hazy idyll of pre-adolescent games and adventures. In densely descriptive and oblique prose, he achieves a kind of sinister and dislocating poetry, an aura of such dreamlike languor that it can only be dispelled by unthinkable trauma. Which it is: a pet rat is poisoned, a nephew dies in an accident at the Perry house, a neighbor dies of a heart attack apparently induced by a visitor, a baby disappears. Holland appears to be responsible, but is he? Or, rather, who is he? Or is he anything at all? These questions are ultimately answered in a series of extraordinary revelations and reversals that convincingly materialize from the dreamlike fabric of Tryon’s prose-world.“The Other” is a unique achievement, a tour de force of style and imagination. Tryon was a modestly successful actor in B-movies before turning to writing, reaching his cinematic apex in Otto Preminger’s “The Cardinal,” where the imperious director endlessly berated him. “The Other” is revenge enough, a literary achievement that deserves rediscovery. 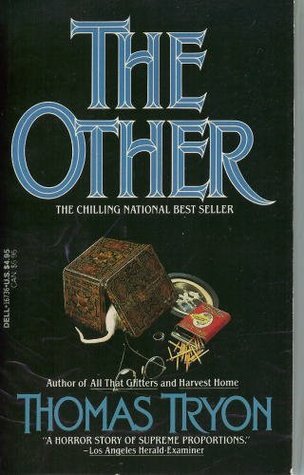 The Other is a classic horror novel, which came out around the same time as Rosemary's Baby and The Exorcist. It's now being brought back in print.Niles and Holland are twins. You know that old cliche about the evil twin? That's Holland. Niles is the good one and Holland...well, when Holland's around, accidents happen. They're young boys and that's what makes this even creepier. (It's actually like that cheesy movie The Good Son, only it's really, REALLY creepy. So I guess really, it's more like The Omen except Holland's just evil, not the devil's son. )This is such a scary book. I've heard of the movie (but haven't seen it yet) but didn't know that much about it (beyond "creepy child"). There are a ton of twists in the story but there's also the fact that the way it's narrated means that as a reader, you don't really know what's going on and how much of what you're being told is real. The whole book really feels like a fever dream, honestly, or like when you're really tired and you think you see things out of the corner of your eye but they're not really there. (I really hope that doesn't just happen to me, because that is not a fun thing.)Anyway. This is an incredibly fun book, but probably not something you should read before bed.It is being re-released on October 2 but I'm running the review early because (a) you can probably find it in used bookstores and (b) so you can preorder it. This would be ridiculously fun to read on Halloween. (Provided, I guess, you don't scare too easily.)Recommended. What a classically creepy book! Reminiscent of the film, The Bad Seed, this story of twins, Niles and Holland, absolutely enraptured me. Despite being written in 1971, it felt modern and had such an ominous atmosphere! It wasn't terribly unpredictable, but more in the way that foreshadowing hints at events than the plot being worn or tired. And, obviously, the twins aspect was a nice twist on the "Bad Seed"-esque plot. My only real complaint came from the edition that I read - it was a first edition that had not been well cared for - it was very musty and just smelled terrible! Though I suppose that the olfactory horror rather added to the horror found within the pages themselves. I am very curious to see the film version. Honestly, I am surprised that this book isn't better known - the atmosphere, plot and characters all stand out so much from the modern psychological thrillers. It's been a long time since I was originally read this but it stands as one of my all-time favorites. It takes a lot to surprise me, and it could be that I was more easily surprised by this book because of my young age when reading, but I didn't see the ending coming and I LOVE it when that happens. It's a wonderfully, creepy and haunting story. Still, 20+ years after reading, I think about this story. The plot and characters were perfectly crafted. I think I may reread this one, as some of the details have left me after all these years. I cannot really comment on the writing style, imagery, etc because it's been too long. But, I can say this, stories just don't stay with me this long unless they were very good to start. I would highly recommend to anyone who enjoys horror or is just looking for a good read. Be warned, though, this is a haunting story that will not quickly leave you. Honest ta Pete, this one's dark! Much better than I expected. You sort of know going in what the set up will be. Twins, one good, one evil, one warm and friendly, the other dark and brooding. Both sharing in The Game and swearing each other to secrets. The strength here is that Tryon knows the reader's expectations, and turns on them by revealing it fairly early on, and letting the foreshadowing build to more darker and more horrible repercussions. Lot's of detail of the 1930's from life on the farm to a midway sideshow. Dark and tragic. Thomas Tryon - It was Noel Coward’s partner, Gertrude Lawrence, who encouraged Tom to try acting. He made his Broadway debut in 1952 in the chorus of the musical “Wish You Were Here.” He also worked in television at the time, but as a production assistent. In 1955 he moved to California to try his hand at the movies, and the next year made his film debut in “The Scarlet Hour” (1956). Tom was cast in the title role of the Disney TV series “Texas John Slaughter” (1958) that made him something of a household name. He appeared in several horror and science fiction films: “I Married a Monster from Outer Space” (1958) and “Moon Pilot” (1962) and in westerns: ‘Three Violent People’ (1956) and ‘Winchester ’73’ (1967). He was part of the all-star cast in ‘The Longest Day’ (1962), a film of the World War II generation, credited with saving 20th Century Fox Studios, after the disaster of ‘Cleopatra.” He considered his best role to be in ‘In Harm’s Way’(1965), which is also regarded as one of the better films about World War II. While filming the title role in ‘The Cardinal’ (1962), Tom suffered from Otto Preminger’s Teutonic directing style and became physically ill. Nevertheless, Tom was nominated for a Golden Globe award in 1963. He appeared with Marilyn Monroe in her final film, “Something’s Got to Give” (1962), but the studio fired Monroe after three weeks, and the film was never finished. That experience, along with the “Cardinal” ordeal, left Tom wary of studio games and weary at waiting around for the phone to ring. After viewing the film “Rosemary’s Baby” (1968) Tom was inspired to write his own horror novel, and in 1971 Alfred Knopf published “The Other.” It became an instant bestseller and was turned into a movie in 1972, which Tom wrote and produced. Thereafter, despite occasional film and TV offers, Tom gave up acting to write fiction fulltime. This he did eight to ten hours a day, with pencil, on legal-sized yellow tablets. Years later, he graduated to an IBM Selectric. The Other was followed by Lady (1975) which concerns the friendship between and eight-year-old boy and a mysterious widow in 1930s New England. His book Crowned Heads became an inspiration for the Billy Wilder film “Fedora” (1978), and a miniseries with Bette Davis was made from his novel Harvest Home (1978). All That Glitters (1986), a quintette of stories about thinly disguised Hollywood greats and near-greats followed. Night of the Moonbow (1989), tells of a boy driven to violence by the constant harassment he endures at a summer camp. Night Magic, about an urban street magician with wonderous powers, written shortly before his death in 1991, was posthumously published in 1995. The dust jackets and end papers of Tom’s books, about which he took unusual care, are excellent examples of his gifts as an artist and graphic designer, further testimony to the breadth of his talents.